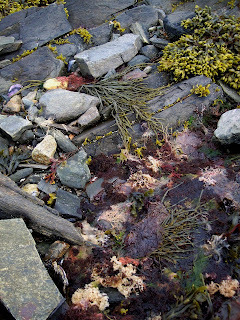 Last weekend at 7am sharp, the tide was right, the weather ok if a tad foggy and hearty folks and children assembled for some tide pool educating. 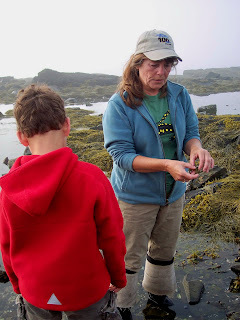 A good friend of mine, Lynne Richard, led a number of kids and adults on a wonderful educational experience of exploring tide pools on the southern shore of Peaks Island. 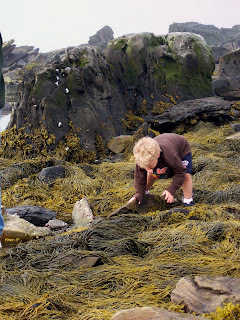 Several pictures were taken reflecting the kids peering into an experience they had never seen before. 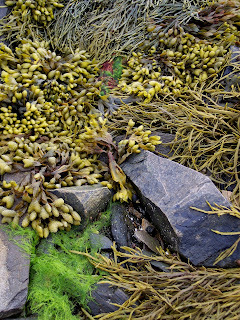 After some thirty years of living on this island, I am still amazed at the environment surrounding us. 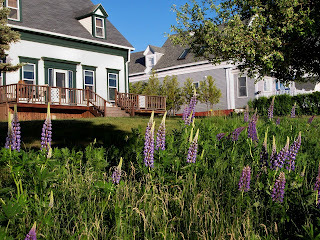 Thanks to Jill for taking the pictures and making the early morning trek; I was still slumbering away at the early morning hour and missed out on this adventure. Enjoy. You can definitely tell when the summer season has arrived. Simply go down front and wait for a boat to come in. 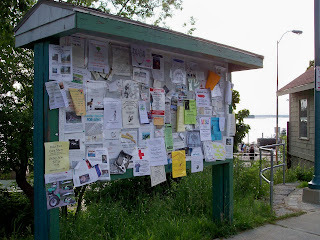 Of course, one has to stop and read the local bulletin board to see what's for sale, any houses for rent and what's going on around the island. 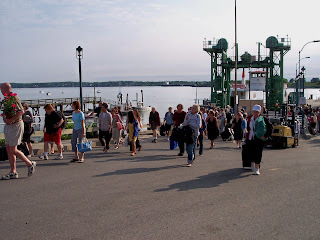 Other people are slowly meandering down to the waiting area and thinking about how to get in what type of line to get back on the boat and head back to the mainland. 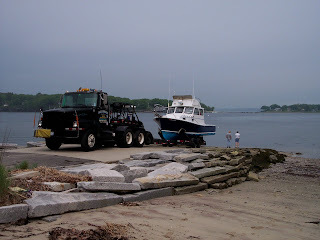 Once the boat is docked, off come the many out of state vehicles loaded down for bear both in, on top of and behind their vehicles; it's moving in time for the week or the summer. 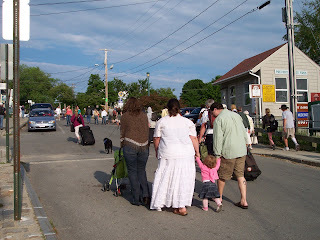 Then the hordes of people come off the boat, onto the ramp and up Welch Street lugging bags, grocery carts, dogs, kids, walkers and anything else that's got a pulse and can make it up the street. 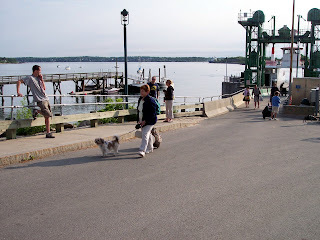 Finally, the year round islanders come strolling off the boat once the hordes have departed. Somehow, we just do not like crowds of people. Let the flatlanders charge off and we'll eventually depart the boat usually talking with a fellow neighbor we haven't seen in a few days. 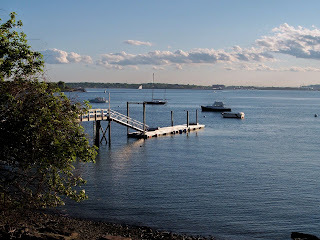 Just another late Spring day on Peaks Island. 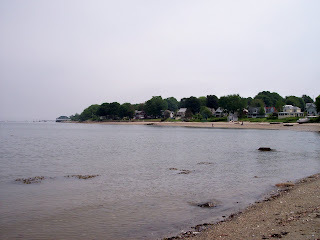 The first Summer day arrived this morning as very warm, humid air flowed in from the south. Mid day temperatures were around the mid 80's. 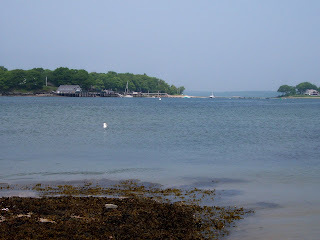 Fortunately, on Peaks Island, we are surrounded by natural air conditioning called Casco Bay. With the Bay's temperature still barely over 50 degrees, the slightest breeze keeps us on the cool side. It's a rare Summer day that a breeze doesn't pick up like clockwork right around noon and today was no exception. The boats were out in force today, the sun was shining and the clouds were just rolling along. 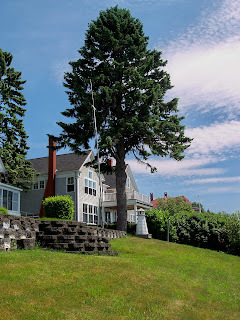 A fine first Summer's day on the Island. 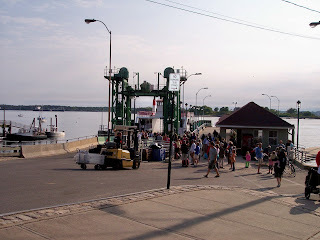 The Casco Bay Line boats were full on every run. I know for I was sitting in my swing watching the Bay go by. What else is a swing overlooking the Bay good for on a nice, warm Sunday afternoon but keeping an eye on everything. Here's some more lupin pictures for you Ronnie. A huge shout out to Kayte who graduated from high school yesterday in Honolulu; way to go Kayte!!!! On to the University of Hawaii--Go Rainbow Warriors! 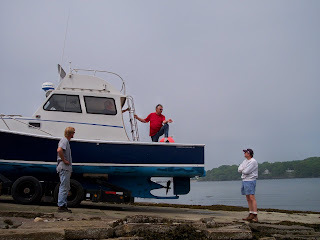 Peaks Island Boys and Their Toys! 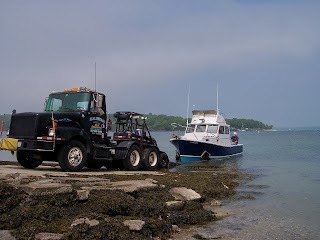 As sure a sign that the cold of winter has departed and that summer is upon us is the annual visit to Peaks Island of the rather large trailer truck lugging boats down my street to the ramp to deposit its cargo of fun into Casco Bay. Over the weekend, about 30 boats from yards all over the island will once again make it to the Bay. 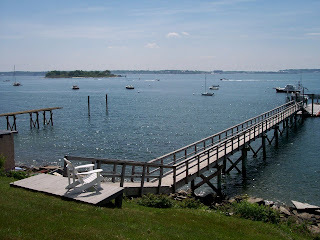 I enjoy seeing the smiles and shiny eyes on the boat owners riding in their vessels down my street to the sea for another season of memory making on the waters of the Bay. As the sign on the truck states, "Hauling Boys and Their Toys"---that is one huge amen brother!! With the price of fuel this season, there may well be much more time spent on the mooring but just to spend time on the water, even if it's at the mooring, is time well spent. 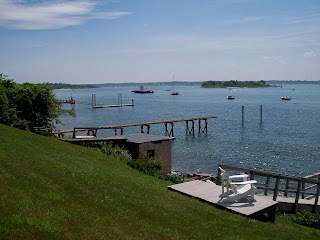 Another boating season has begun on the island and another fresh chaptor in island living is about to be written. 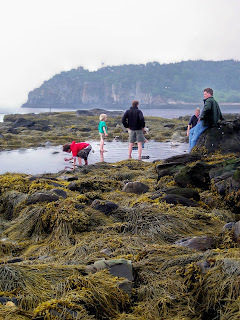 Saturday finally brought some much needed rain to Peaks Island. 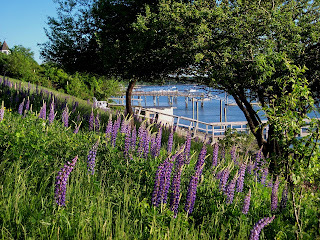 At long last, everyone could take a down day and recover from the Memorial Day Weekend hordes of walkers, bicyclists, strollers and golf carts clogging the island's roads. Nothing like a good book on a rainy day to settle one down and restore some order to the universe. 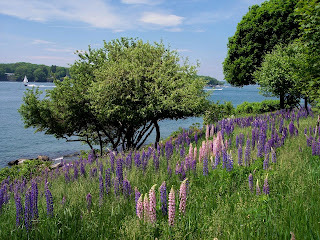 At long last my favorite wildflower, the lupin, has returned. 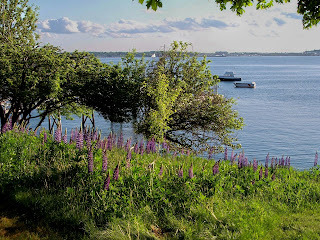 For two short weeks the island is covered with these beautiful, free flowing purple, pink and white long stemmed flowering wildflowers. They are simply beautiful. Every year I wait until the early ones are getting nearer to blooming, dig a few up and move them around the property and let them run wild and do their thing. After so many years here, they are everywhere. Alas, it's only for a couple of weeks but while they're out, it's a sight to behold. 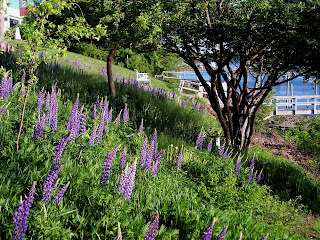 Tonight was a crystal clear evening so I took my camera out for a few pics of the lupins. 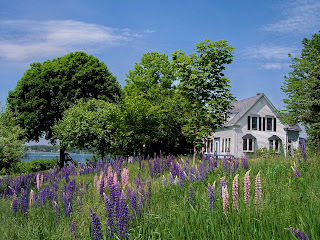 For my niece Ronnie in Hawaii, this blog's for you; enjoy your favorite Maine wildflower.